Portal 2 came out a few weeks ago, after the gloriously frustrating, exciting, confusing and ridiculous ARG involving potatoes, Paul and I did what any self-respecting gamer would do. Yes, we set our pc’s up in a dark room, loaded up with snacks and LAN’d it up. We played through the entirety of the co-op mode and have gathered our thoughts. Here’s a clue: we liked it. 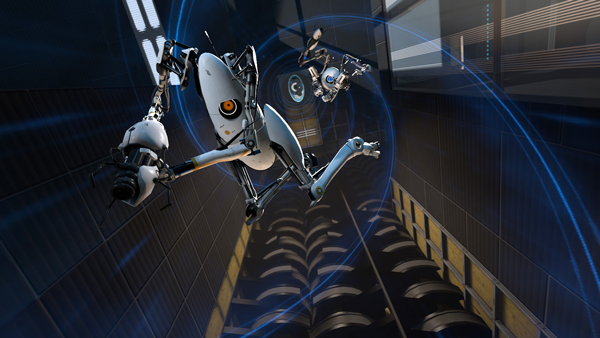 So, Portal 2. Lets talk co-op. It’s really quite good. And funny. Not to mention unique; I never thought using portals could be more fun, until it was turned into a 2-player experience. Awesome! Yeah there’s nothing else like it. Are there even any other co-op puzzle games? Lara Croft and the Guardian of Light, perhaps… But there was a distinct lack of portals in that. Yeah, but that focused on combat too… There’s not a single enemy in any of the Portal games, not in the traditional sense of the word, at least. Traditional enemies, no. Dozens of charming little turrets that want to see you riddled with bullets, yes. The puzzles themselves are your true enemy, but tackling them with a friend turned out to be even more fun than by yourself. How many times did you inadvertantly crush me with something? In all fairness, I’m pretty sure I removed a light bridge from under your feet a number of times, allowing you to fall to your death. We certainly had to spend a good while on more than half the puzzles shouting and screaming what we thought was the way to do it, especially when we were being shot at by turrets. What surprised me though is after having finished the co-op game and going back to a random puzzle, we were completely stumped again. I can vouch for this. 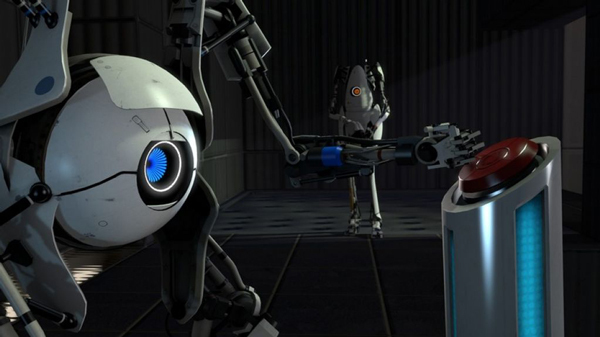 Playing it through with a mate when neither of you have played it is undoubtedly the best way to experience Portal 2’s co-op mode. However, since I played it with Ivan after we both finished it, I was surprised at how little of the solutions I could remember. But then maybe my brain is just broken. It definitely is. Why else would you still have so many unfinished and unopened games in your house? Anyway, what did you think of the gestures? Giving your partner a high-five or pointing and laughing at GLaDOS as she looks at you through a security camera was pretty entertaining. A throwaway gimmick that helps evolve the characters personality and even aid the plot? Only Valve could pull that off in this way. And high-fiving after solving a puzzle is just as satisfying as it should be. I liked that the co-op took place in a sort of ‘hub world’, where you often returned to after a chapter in order to go to the next one, or to simply replay previous chapters and specific puzzles. Think the castle Super Mario 64, only smaller. Yeah that works well, and fits the nature of the co-op in general. 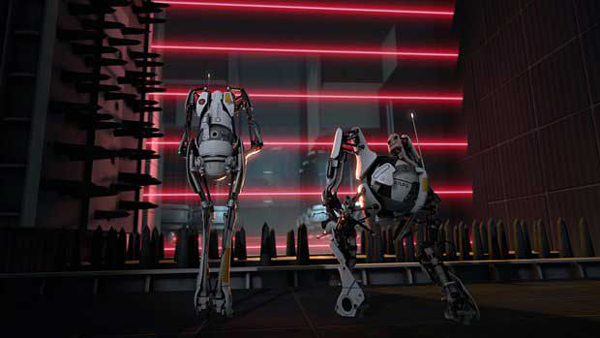 You’re these 2 disposable robots in a seperate section of Aperture, and totally dependant on GLaDOS. She’s on top form yet again, by the way. Some of her funniest lines are to be found in the co-op mode. Witnessing her attempts to control and even simply comprehend the robots’ emotions during the puzzles was brilliant, and there were a few hilarious surprises along the way that had us laughing for ages. And it does have a story! Though we shouldn’t discuss that. Absolutely not, because figuring out what was going on was one of the coolest things about it. Suffice to say that you’re not only there to be tested. It’s a wonderful complement to the singleplayer. I hope most people who got the game will get to experience it. What about replayability, then. I plan to go through it with a couple more people to get the most out of it, but having gone through a second time yourself, would you say the fun could really last much longer than that? It did take me a while to notice our stats were being tracked. Steps taken, portals fired, even how many hugs our robots shared. At first I thought it was all just entertaining dialogue, but we were actually in competition with each other. Quite how either of us was supposed to win though, I’m still not sure. I’m pretty sure its just GLaDOS messing with our minds. But the question is, do robots really have minds? Also can they make toast? We did survive Judgment Day… so I like to think they don’t yet. And my toaster is definitely not sentient. Thank goodness. Well, the main thing I’ve taken away from Portal 2 is that I really bloody want a portal gun; the work commute would be so much better. The co-op, however, has taught me that co-op puzzle-solving is an absolute blast and is certainly tons more fun than going solo. Not to take anything away from the utterly fantastic singleplayer (review of that will be done soon) but Valve showed once again how working together is more fun than trying to kill each other. Co-op is the future, if it isn’t already the present! 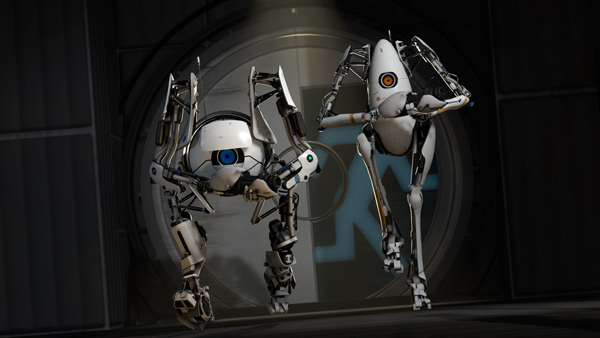 This entry was posted in Thoughts and tagged co-op, portal 2, valve. Bookmark the permalink.